Three day ride into Konkan (West Maharashtra). The plan started when a cousin announced house warming pooja at his new house at Ratnagiri. I have not gone beyond Chiplun on NH-17 so thought this is a good excuse to do so. Its summer time so I did not want to ride in noon. Ratnagiri is around 7-8 hour ride so I decided to break it up. We started early in morning on Monday at around 5.30am. Weather was nice and we reached Mangao junction quiet quickly. From here you have to turn right for Shrivardhan/Harihareshwar. BN guys had given pointers already so had decided to halt at Shrivardhan and then roam around. We ordered for lunch and had a quick stroll on the beach. Beach was empty and water was warm to walk in. Lunch was ready by the time we returned. Dry chicken was delicious and the rotis were nice too. A nice nap was inevitable. After I got up, noticed that the rear tyre looked little out of shape. Quick check revealed that it had lost much air! I scanned the tyre but didnt find any nail or anything. There was a tyre shop in town but it was nearing 5.30 in evening (Shrivardhan town faces electricity cut between 5.30-8.30 in evening. I rushed to the shop and found that it was a bicycle shop. The guy could not find any nail either so I just filled up air. It was quiet late in evening and we decided to ride to Diveagar. Its 16kms from Shrivardhan. The road that leads there goes right parallel to the shore. It was first next-to-sea part on the trip. We visited famous temple in Diveagar. One lady had found a golden statue of Ganpati while she dug her yard. This was kept in a copper suitcase. This suitcase and the idol is kept inside the temple. The statue is nice and detailed. After that we rushed to the beach to catch sunset. There was a surprise waiting. We could do parasailing on the beach. Its a brief flight but nice first time flying experience. Paisa wasool! Next morning I took a morning walk on the beach. You can find a lot of stuff lying on the beach. Shrivardhan is also good for bird watching. I could spot big vulture near the resort itself. After lovely kaande-pohe+bhaji breakfast (and complimentary fresh coconut water) we started for our destination. Rear tyre had again lost some air so I topped it up. We had decided to take the ferry route. 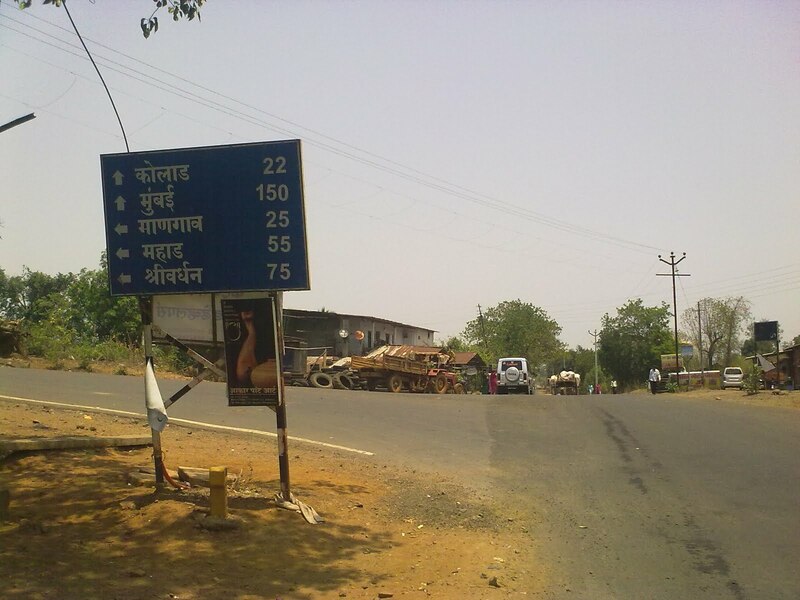 Other option was to come back to Mangao on NH17 and reach Ratnagiri via Mahad. For the ferry route, you have to come to Bagmandala. This is aprox 20kms from Shrivardhan and you pass Harihareshwar (16kms) on the way. We could spend some time here but we didnt as we had started late. The ferry shuttles between Bankot and Bagmandala shore and its hardly a 5 min trip. The ferry can carry three SUVs and few bikes along with people at a time. We had to wait for half hour as one ferry had left just as we arrived. Few vehicles had lined up by then. But when the ferry came, only one autorikshaw got in and we. Apparently the auto guy had paid extra for ahead of schedule ferry. They were okay with us travelling with them. One of the guy asked about the riding gear and our plans. He was quiet impressed. After getting down, I refilled rear tyre and continued. Mandangad was around 15kms from here. Road was okay. At mandangad I found a decent tyre mechanic and he found a small nail that was causing loss of air. This I think got in on the bad patch near Mhasala. Thanks to tubeless, we were not stranded there. And the puncture was fixed in 2 mins! I was relieved with this and the smooth road ahead made the journey cool, despite the hot Sun! We were approaching Khed and this area is near my village. Entire terrain, houses, divided farms, stone borders, teak wood was a familiar childhood scene. We reached Khed and I stopped near Khed bus station for quick pics. 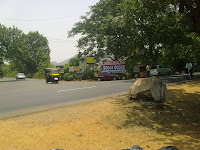 Khed is local hub for villages near it for the state transport buses. We used to spend time here while we changed our buses during our summer vacations. From Khed it was another 3 hour ride further so we took a break. The road ahead was pure pleasure. Kasedi to Ratnagiri is I think the best part of NH-17 in Kokan. Awesome high speed curves and smooth tar is delight. We reached Ratnagiri by evening. My aunts, cousins and parents were already here and we were critisized for choosing to ride :) But the loaded saddle with saddle bags, GPS, tank bag, riding gear etc was a little amusing for them :D We spent the night and next day morning for the pooja here. Village Khedshi near Ratnagiri is maternal home for my Mom so we visited that in morning. After dinner we had planned to leave for Chiplun. Village Nayashi is on the way. Our ancestors belonged to this village so we wanted tovisit the temple there. Searching this temple took almost an hour and that delayed our plans. But visiting that place was a thrilling experience. We stopped for tea at Hotel Pacific, 20kms before Chiplun. Its a mountain top hotel and you can eat in the open lawn. Rates are reasonable despite the great ambiance. Seems its a perfect evening spot for Chiplun people. There were two couples and the men were curious! We reached chiplun in half n hour and met my uncle. It was a meeting after many years. We got our Kombadi-Vade from Abhishek for dinner. After finishing it quickly, we went to sleep. We got up early and started return journe by 5.45am. Riding home is boring part on any ride! But the geat Parashuram/Bhoste ghat was another treat to ride first in the morning. We reached Khed quickly and visited another temple. Raptor moved into reserve and petrol was not available in any pump there. Next pump was at Poladpur (35kms away) so I decided to ride sane to get maximum FE. We descended entire Kashedi by cutting off engine and this ghat is still fun to descend with gravity!! It was almost 8am and we had to speed up. We did 3digits on speedo to make up for the time and utilise the empty road. Only roadblock we faced was near Pen. There was a smal accident and cars had blocked entire road. Blame it on the stupid drivers who utilised the wrong lane because of city driving habits. We managed to cut that out by using the shoulders. Another halt at Karnala and we reached home by 12.30noon to complete a 877km Konkan roadtrip without incident! It started off with Chaitanya's call for a ride through ghats. His original plan was intimidating, considering the heat. Hence I had decided to ride a subset of the plan. I started the ride by 6.15/30 in the morning. Another rider was going to join me but he was running late, so I decided to ride on. There was a guy couple on a Unicorn who were riding to Pune for first time. After asking for route, they got little confident and tried to give me a company. After they cut my line nastily near Panvel toll post, I decided to zoom ahead and leave them behind. Roads were empty and I reached Lonavala quickly. Unfortunately the bhor ghat patch is under repairs so climbing up was not much fun. Pune team was waiting when I reached RK. We waited for fellow rider Sachin to join in and we refilled our tanks. 2.5kms before Ambey valley, Nalin and 2 others decided to return. Here Sachin suggested we take a diversion and reach Tamhini directly, rather than riding back to Lonavala and coming down via Pali. And this route was horrible! At places it was resurfaced and fine sand sprayed generously. Where it was to be resurfaced, big stones were present. Otherwise there was no road at all! After 30kms of such off-roading, we reached a T junction. Mulashi was on left and tamhini ghat on right. I decided to split here and ride back. It was 11:30am and I wanted to reach home by lunch. The road was better and it took me via tamhini ghat till Kolad. There are few eating places along the route and some farms and exotic properties (gold valley konkan). route was scenic but the heat and promise to be home for lunch kept me going non-stop. Earlier I had expected that we would be coming back to lonavala after aambey valley and then descend throug khopoli-pali till NH17. 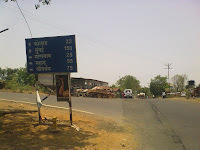 But I had come farther along the NH17 till Kolad. Riding on NH17 was like riding on a hotplate. There was congestion near Pen due to an accident. The long queue of trucks and trailers made it worse. Headache was setting in and mini-water shower and drinking did not help. The air filter warning started coming in and the bike felt little sluggish above 100. I stopped at Wadkhal and got filter checked. The guy insisted that the filter is clean and put it back on. I gave a call to Venkat Sir and he said its ok to ride. The oil film on sponge might have gone and hence the sensors are complaining. It was a lone rip since I had separated and it continued till I reached home, overtaking every damn vehicle along the route. Reached home at 3:10! Here's GPS track of the ride. लोकसत्तामध्ये छापलेल्या ३ लेखांची जोड येते देत आहे. रणशिंग फुंकले..शुक्रवार ३० एप्रिल २०१० सोनेरी इतिहासाला झळाळी द्या! पुढे या! प्रतापगडाच्या जीर्णोध्दाराचे रणशिंग फुंकले एका गुजराती तरुणाने! महाराजांचा वारसा मिरवणारे बरेच आज स्वत:ला महाराज आणि राहत्या घराला रायगड बनवण्यात गुंतले आहेत. महाराजांचे नाव पुढे करुन जनतेला त्यांचा विसर व्हावा हा त्यामागचा उद्देश असल्याचे वाटल्यास नवल नाही. निवडणुका, स्व-प्रतिष्ठा आणि छानछौकीसाठी करोडो पैसा खर्च करणार्‍यांनी असल्या कामासाठी पैसा खर्च केल्याचे मला ऐकिवात नाही. सागरी पुतळ्यासाठी ३०० करोड खर्च करण्यास तयारी आहे पण मग ज्या दगड-मातीत महाराजांनी स्वराज्य खरोखर घडवले ते असे उपेक्षित का?? ऍक्सिडेंट हो गया रब्बा रब्बा! It was an usual evening commute to home and I was riding with my colleague as pillion. We were riding at around 70kmph near Powai and suddenly a drunk came running across. There was no stopping distance between us. I started pumping brakes but ran into him straight. I think the guy tried to stop me and hit his hand on my right end of handle bar. This deflected me and bike tipped on left side. Bike and I hit the road and we started to slide! We slid along the smooth concrete road for 1-2 meters and came to a halt. My knee took a small jerk on impact and shoulder took the sliding friction. When we stopped, my left leg was between rear tyre and road and couldnt free it easily. The bike had to be lifted a little to free it up. There was car behind us but it had managed to stop in time by hard braking. We got up and straightened the bike. I saw around and that jerk was lying flat on his back. First I felt he came under the car but he was safe. Now people had come forward and I took the bike aside. We checked ourselves. Both of us had hit knee first but had just scratches. Colleage had a shoulder bag hence he didnt get hurt on shoulder. My helmet had slightly touched the road. I had Cramster jacket and I remember it being pulled along against the road. It really saved. Having a knee guard and riding boots would have made it a true zero impact incident. The guy was bleeding little since his face hit the ground. He was spared because of that, otherwise I would have made sure that he sees his own blood of his face :) Apparently he was being chased by someone and then he had started running across the street. The guy following him and onlookers started shouting at them for their act and we were not interested further in their discussion. The saree guard did not have foot bar like it had on previous ones. If it had been there, it would have added some clearance between road and rear end and avoid foot getting trapped. Need to check if previous one would fit in, I had taken it off and might have it with me yet. All in all, a lucky save. Thode me nipat gaya!